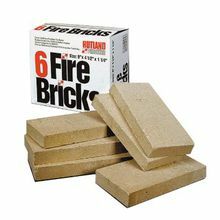 Use to build new Fireplace Fire Boxes and to Replace Broken Fire Bricks for Firebox Repairs. Service Temperature- 2000º F, Size - 9" x 4½" x 1¼" thick. Packaged 6 bricks per corrugated box. In case the bricks need to be cut to fit your unit, please use a masonry saw for the best results.